Since Sam Houston State defeated Cal State Northridge in 1982 for the first DII softball championship, 36 more national champions have been crowned. Surprisingly, the exclusive club of multiple-time winners is very small, with just six members currently admitted. The past nine seasons, starting with Hawaii Pacific’s national title in 2010 championship series, have seen first-time winners. The last school to win its second championship was Lock Haven in the 2009 season. 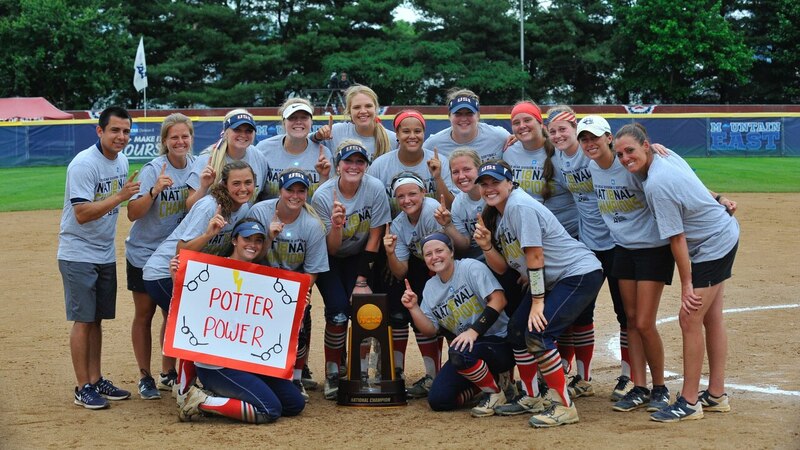 Let’s take a look at the programs with the most DII softball championships. Head coach Gary Torgeson’s Matadors owned the CCAA and pretty much DII softball for most of the 1980s. They won the CCAA in each of their nine seasons as a member and won four DII titles along the way. CSUN appeared in the first six DII softball championship series, winning three in a row after losing the inaugural title match to Sam Houston State. California sure had a monopoly on DII softball in the early years of its history. After CSUN’s history at the top concluded, the Roadrunners took over. CSU Bakersfield won three titles, all in a row under head coach Kathy Welter. It defeated CSUN 6-2 in 1990 for its final DII title in a showdown of softball superpowers. After the Roadrunners run ended, we saw four new winners in a row. Then, a pair of back-to-back champions changed the DII softball landscape. Kennesaw State won in 1995 and 1996 followed by California (Pa) in 1997 and 1998. Humboldt State followed the Vulcans in 1999 and would capture its second title in 2008, the longest stretch between DII softball championships. If anyone can call themselves the DII softball power of the 2000s, it’s Lock Haven. The Bald Eagles are the only team with multiple championships this century and nearly had a third, losing by one to SIU Edwardsville in the 2007 championship. 2018 *Southern Indiana (40-23) Sue Kunkle 8-3 Saint Anselm Salem, Va.
2017 *Minnesota State (64-7) Lori Meyer 5-1 Angelo State Salem, Va.
2014 *West Texas A&M (60-7) Kevin Blaskowski 3-2 Valdosta State Salem, Va.
2013 *Central Oklahoma (51-11) Genny Stidham 5-2 Kutztown Salem, Va.
2012 Valdosta State (58-5) Thomas Macera 4-1 UC San Diego Louisville, Ky.
2011 UC San Diego Patti Gerckens 10-3 Alabama-Huntsville Salem, Va.
2010 *Hawaii Pacific (50-8) Bryan Nakasone 4-3 Valdosta State Saint Joesph, Mo. 2009 Lock Haven (51-6) Kelly Green 8-0 Alabama-Huntsville Salem, Va.
2006 *Lock Haven (56-4) Kelly Green 3-0 Emporia State Salem, Va.
2005 * **Lynn (54-7) Thomas Macera 5-3 Kennesaw State Salem, Va.
2004 Angelo State (47-11 Travis Scott 7-3 Florida Southern Altamonte Springs, Fla.
2003 *UC Davis (53-15) Kathy DeYoung 7-0 Georgia College Salem, Ore.
2002 St. Mary's (Texas) (58-11) Donna Fields 4-0 Grand Valley State Salem, Va.
2001 Nebraska-Omaha (54-6) Jeanne Tostenson 4-0 Lewis Salem, Va.
2000 North Dakota State (68-10) Mitch Hanson 3-1 Kennesaw State Columbus, Ga.
1999 Humboldt State (55-7-1) Frank Cheek 7-2 Nebraska-Kearney Salem, Va.
1998 California (Pa.) (49-7) Rick Bertagnolli 2-1 Barry Pensacola, Fla.
1997 *California (Pa.) (53-5) Rick Bertagnolli 2-1 Wisconsin-Parkside Salem, Va.
1996 Kennesaw State (49-8) Scott Whitlock 6-4 Nebraska-Omaha Emporia, Kan.
1995 Kennesaw State (53-5) Scott Whitlock 3-2 Bloomsburg Salem, Va.
1994 Merrimack (45-4) Michele Myslinski 6-2 Humboldt State Shawnee, Kan.
1993 Florida Southern (45-11) Chris Bellotto 11-5 Augustana (S.D.) Shawnee, Kan.
1992 Missouri Southern State (50-7) Pat Lipira 1-0 Cal State East Bay Shawnee, Kan.
1991 *Augustana (SD) (61-4-1) Sandy Jerstad 3-2 Bloomsburg Midland, Mich.
1990 Cal State Bakersfield (44-11) Kathy Welter 6-2 Cal State Northridge Midland, Mich.
1989 Cal State Bakersfield (38-23) Kathy Welter 8-5 Sacramento State Sacramento, Calif.
1988 Cal State Bakersfield (54-9-1) Kathy Welter 4-3 Lock Haven Sacramento, Calif.
1987 Cal State Northridge (58-7) Gary Torgeson 4-0 Florida Southern Quincy, Ill.
1985 *Cal State Northridge (62-19) Gary Torgeson 2-1 Akron Northridge, Calif.
1984 *Cal State Northridge (51-12-2) Gary Torgeson 1-0 Akron Sioux Falls, S.D. 1983 *Cal State Northridge (35-20-2) Gary Torgeson 1-0 Sam Houston State Orange, Calif.
1982 Sam Houston State (40-6) Wayne Daigle 3-2 Cal State Northridge Stratford, Conn.
** Lynn’s participation in the 2005 tournament vacated by NCAA Committee on Infractions.